I set off early doors on Halloween in the dark of night from some hotel Mansion courtesy of ITV to park the car outside the front door of Bolsover Castle. It was 5am and I was to carve a pumpkin for ITV Day Break, only the day was far from breaking as it was pitch black! 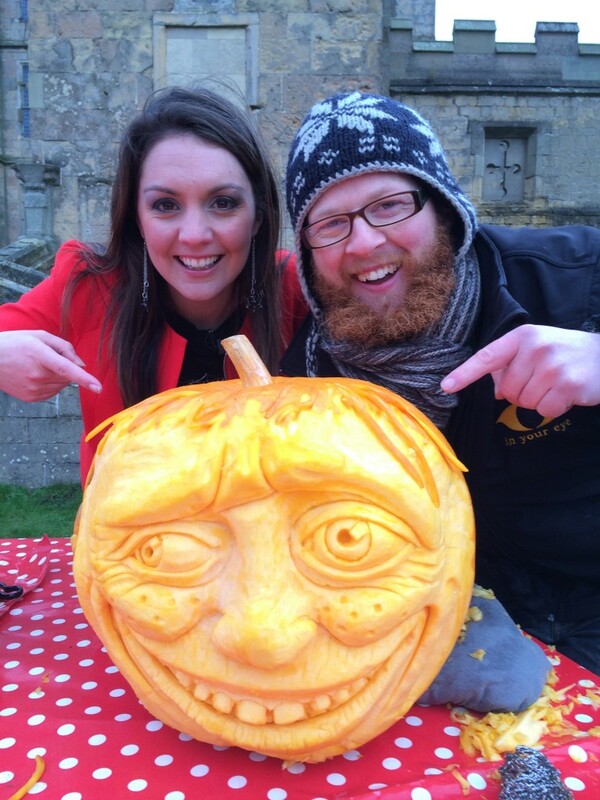 I met was met by the producer Jon and weather presenter Laura Tobin and set about carving the pumpkin. Laura introduced me on the Telly as a ‘Professional Pumpkin Carver’ which I had never been referred to as before. We’ve not been carving pumpkins long but sculpture is sculpture and once you know the craft of the particular material there is not much difference. At 6am some children then turned up in all their Halloween regalia to also carve pumpkins. I was not expecting competition but they were not hostile and had nice things to say about my pumpkin. They then set about carving their pumpkins all smiles and happiness with a bit of intermittent shivering and near hypothermia thrown in. It was very, very cold! Between takes Laura Tobin and I were having a little chat and then Jon said that we were ready for the big reveal so that the ITV viewers could see the pumpkin. I had been taking it easy and lost track of time so I managed a final flurry and got our pumpkin grinning a broad smile. As I turned the pumpkin to the camera I said “He is inspired by Aled Jones but I am not sure I have achieved a good likeness.” What do you think?